A Tale of Three Glocks. 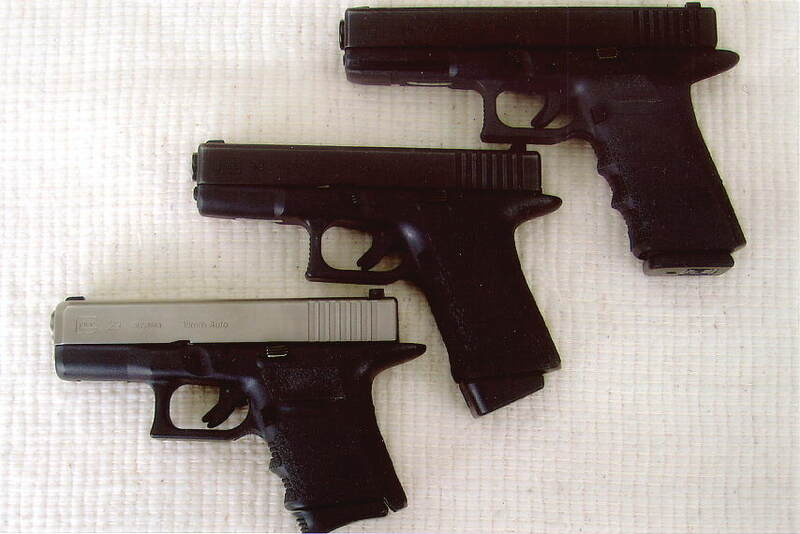 BTC frame modifications were done to the G29 (bottom), G19 (center) and G20 (top). My wife's G19 was the first gun Dave Bowie worked on. I've heard the complaint at the range quite a bit, and it's posted frequently on the various internet boards where the on-line firearms community discusses Glocks. "You know, I really like my Glock, it shoots great, but I just can't get used to that grip." Or: "I wish my Glock had a better grip. Maybe I'll try one of those Hogue rubber things." Or, worse: "I just can't get used to the grip. I guess I'll sell my Glock and get a [insert here, e.g., a Springfield Armory XD, a Smith & Wesson M&P, etc.]. Purchasing another pistol because the Glock you already own doesn't fit your hand is, in my opinion, just throwing away good money. For less than the cost of another gun, extra magazines, and accessories for it (like night sights or holsters), you can have your Glock's grip tailored to fit you - the way it should have when it came out of the box. It will feel and handle better, allowing you to invest your dollars in the next logical step: learning to defend yourself with it, which includes manipulating, moving, shooting, and fighting with the gun. While grip "reductions" to Glocks aren't new - Robar's offered them for a number of years - the purpose of this article is to review the grip modifications that Dave Bowie at Bowie Tactical Concepts (BTC) performed on my Glock 29, Glock 20 and my wife's Glock 19. Originally from West Virginia, Dave grew up around firearms and learned to hunt while quite young, taking his first deer, alone, at age 12. He also exhibited a penchant for tinkering on mechanical things from an early age. Over the years Dave's evolution toward custom pistolsmithing continued steadily: what started as a hobby tinkering on his personal guns became a passion for enhancing Glocks for easier concealed carry and improved reliability, eventually becoming full-time work as Bowie Tactical Concepts. 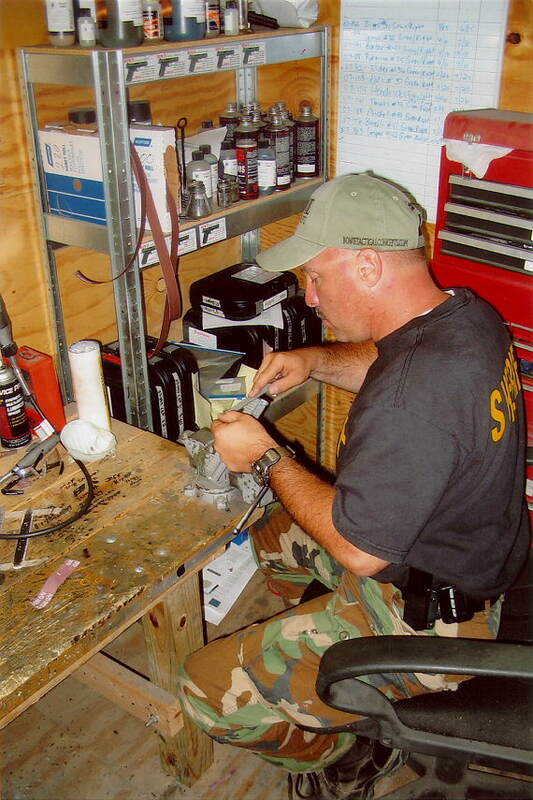 Many of Dave's customers believe he supervises numerous employees who do the actual reduction and stippling work. Not true! When your gun hits the BTC bench, it's Dave's hands that do the work. He's both the owner and the shop's only 'smith. Opened in 2004, BTC was the logical business extension of Dave's love of working on handguns and experimenting with different modifications. He's also carried a gun daily for 20 years. His custom work is informed as well by his instructor experience at Tactical Defense Institute (TDI). For many years he's taught the handgun courses in which students learn defensive skills while firing thousands of rounds in realistic training scenarios. From all of this, Dave has developed some firm opinions on what modifications are essential not just in a "carry gun," but in a concealable fighting gun that you might have to draw and use. He appreciates the distinction between modifications that are "nice to have" versus those which are "must have." In the latter category are BTC modifications designed to boost user-performance (grip reductions, stippling, and beavertails); to ensure operability (the BTC reliability package on Glocks, for example); and to enhance the gun's concealment and snag-free withdrawal when needed (contour and radius work to the slide and frame). That he can even find the hours in his life to work on a large volume of polymer guns indicates the man's drive and energy level. When I interviewed him in 2007, Dave was a full-time deputy sheriff in Adams County, Ohio. 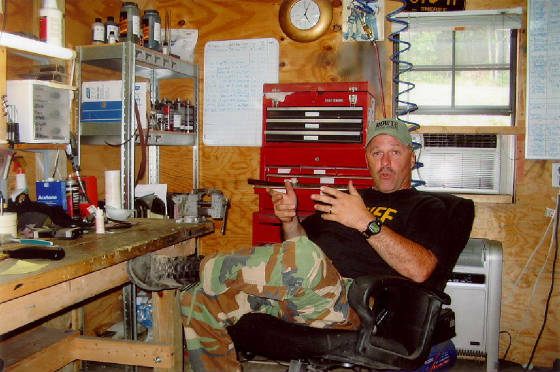 His duties at TDI, also located in Adams County, include being the lead or co-instructor for numerous handgun and rifle courses. He also instructs TDI's advanced concealed carry course for students who've completed the prerequisite series of handgun classes. As demand for BTC's grip modifications expanded, the work on Glocks alone came to consume "at least 40-hours a week," Dave said. He indicated that some of his customers just assume that BTC is housed in a 5500 square-foot building in which he oversees 30 employees, one of who is specifically tasked to fetch him soy lattes and yogurt. Not so. When your gun hits the BTC bench, it's Dave's hands that perform the actual modifications. He's the only 'smith in the shop. 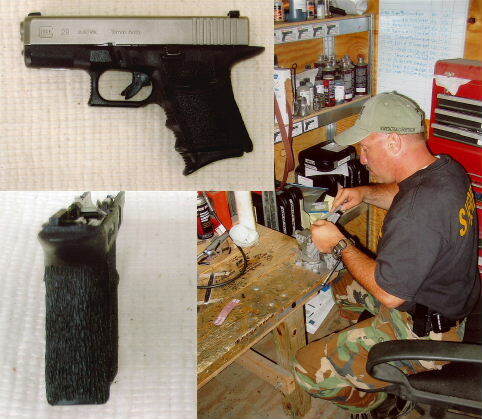 Here, Dave adds forward bracketed cocking serrations to a Glock slide before refinishing it. While Dave is well-known for his grip reductions and stippling on Glock frames, he actually began modifying slides before doing frame work. BTC modifications are now offered for the full-range of polymer handguns: Glocks, Springfield Armory XDs, Smith & Wesson M&Ps, HKs, and Kahrs. Most of what follows, however, deals with the grip work on my Glocks. David is understandably reluctant to disclose the specifics of his 360-degree reduction process, but his technique achieves "full grip reduction with full stippling." It's a comprehensive reduction to the entire grip, not just the removal of the back-strap "hump" material with some filler added in. After reduction, the grip's circumference is at least a 1/2 inch smaller, he states. No chemical spray-on compounds are added, nor is the grip painted. Dave works with the existing grip material and solidifies the entire reduction area. Then he stipples it, aggressively or moderately, as the customer desires. During a training visit to TDI, I got to handle and examine a BTC Glock 21 that had a full reduction and stippling. 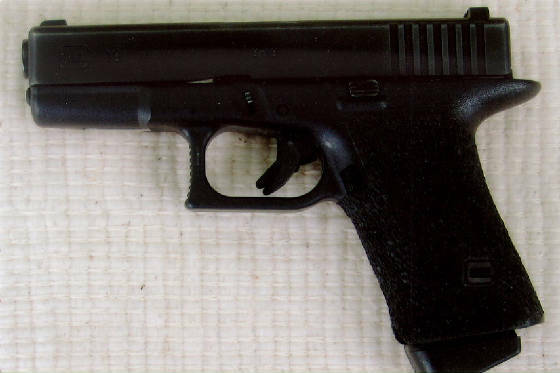 The whole grip indeed exhibited a significantly narrower taper than my then-stock Glock 20 (which is identical to an unmodified G21). The back strap was straight, without the slightest protrusion. The stippling was detailed and precise, wrapping completely around the grip, and the finger grooves were gone. In fact, Dave reports that about 90% of customers who send him post-1997 (3rd generation) Glocks request the 360-degree stippling and removal of the finger grooves. While BTC is widely known for its frame reductions, Dave offers slide modifications for the same range of polymer guns. Ironically, Dave began doing slide modifications back in the mid-1990s, before offering his grip reductions. Slide options include dehorning, adding front cocking serrations, sight replacement, and contouring the slide and ejection port for snag-free carry. For refinishing work, BTC offers choices of black, gray or olive drab. 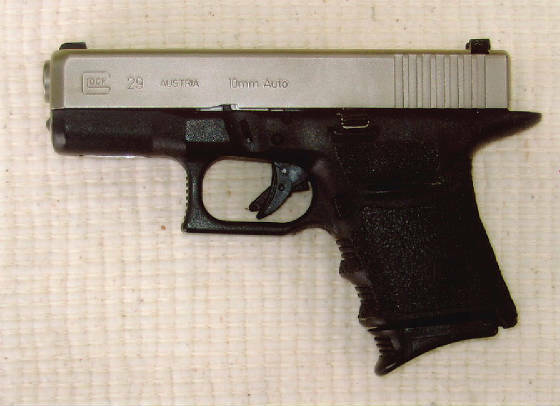 Side View of Glock 19. This G19 was a 2nd Generation gun without finger grooves. The frame received BTC's 360-degree full grip reduction with full stippling, along with a well-crafted beavertail. (3) Moderately aggressive 360-degree full stippling around the grip ($60). Closer View of Glock 19 Frame. BTC reduction work left the frame narrowly tapered. Total grip circumference is significantly reduced which, along with the beavertail, allows Wife's shooting hand to get a higher, consistent hold. Gradation of the stippling is moderately aggressive. Dave completed this work promptly. What resulted was a much narrower and well-stippled grip, as the pictures indicate. Not only could my wife get her hand more firmly around the grip, because the total circumference was less, she could finally get a comfortable hold without having to shift her fingers or palm around each time she grasped it. As with getting a consistent cheek-weld on a rifle stock, gripping a pistol the same way every time, especially without having to think about it, aids in accurate shooting. Dave's work on the G19's frame is an example of BTC's 360-degree "full grip reduction with full stippling." Robar refinished the barrel and slide with its NP3 treatment. Some years later, David Bowie reduced and stippled the backstrap, added a beavertail extension, and created a radius under the trigger guard at the front strap. This work allows for a higher grip and thus better control. With the infamous Glock "hump" eliminated, my large hand obtains positive seating under the beavertail. As much as I wanted to like the grip on my G29, and tried hard to find a repeatable sweet spot, the fit was never 100%. I have large hands, so the big G20s and G21s really aren't a problem, hump or not. In fact, as noted below, the BTC mods to my G20 were more of an afterthought, done for consistency with my G29, rather than because they were needed. My G29 is a true custom Glock - a beautiful little blaster. By "custom," I mean that, at different times, both the frame and slide had aftermarket modifications performed, but in each case there were utilitarian benefits. Robar refinished the slide soon after I acquired the pistol. Several years later BTC did the frame modifications. Truthfully, had the timing been reversed, I would have asked Dave to refinish the slide when he did the reduction work. I bought this gun in "like-new" condition. The previous owner shot it once or twice, but that was about it. I test-fired it with a variety of hot 10mm loads before purchase, so I knew going in that there were no reliability issues. There was, however, a noticeable, jagged scratch across the slide's left side near the "10mm" imprint. 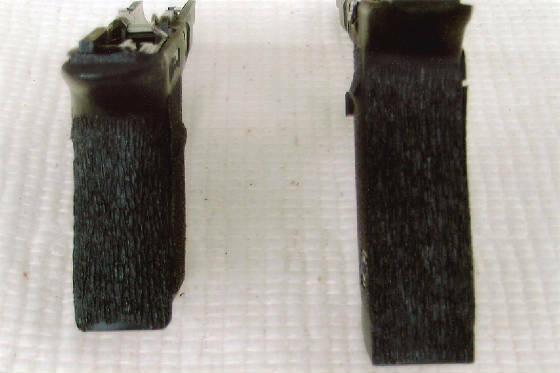 This blemish provided the opportunity to send both the slide and barrel to Robar for application of their NP3 finish (which included treating the slide's internal metal parts). NP3 is not only corrosion-resistant, but its chemical composition creates an inherent lubricity that makes oiling the slide or barrel unnecessary. It retains a mirco hardness of 48-51 Rockwell as plated. Clean-up after shooting sessions is a breeze because the fouling and crud just won't stick. The finish is also eye-catching, appearing satin gray indoors. In sunlight, the color seems more like a non-reflective light gold. (3) radiusing under the trigger guard at the front strap, for a higher purchase ($10.00). Rear View of Two 10mms. 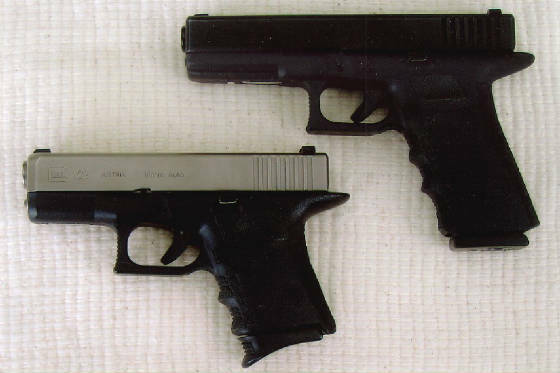 G29 (l) and G20 (r) received the same frame work: reduced and stippled backstrap; a beavertail; radius of trigger guard at top of front strap. 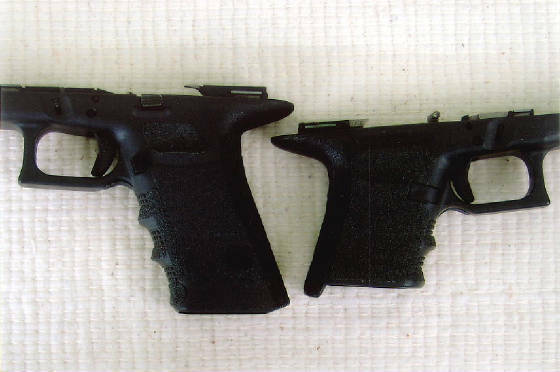 Note that only the G29's back strap was reduced and stippled, so, unlike the G19 above, it was not a full 360-degree stippling. Total reduction is thus somewhat less without that additional stippling, but for my hand it was perfect. I'm also in the minority of BTC customers in that I opted to keep the finger grooves (they work for me). After Dave returned the frame, I added Decal's thin, gritty adhesive strips to the panels and a bit on the grooves for increased grip-ability. These, too, work for me. All three BTC mods were geared toward achieving two goals: obtaining a consistent grip during the draw stroke and, when shooting hot 10mm loads, having more control over the weapon during rapid-fire (i.e., double-taps, triple taps). I can say without hesitation that Dave's work achieved what I wanted. Side View of G20/G29 Frame Work. Here, the radiused area under each trigger guard is clearly visible. The stippled backstrap is also prominent. For me, the backstrap reduction on both guns shrunk the grip enough to substantially improve handling and shooting. The factory revolver-grip, is gone; instead, these guns point and feel like 1911s. But I'm in the minority of BTC customers who opt to retain the finger grooves. They "work" for me. Eliminating that hump worked wonders - the gun now points and handles like a double stack mini-1911 - but for me the key to consistency is really that beavertail: it acts like a locating devise for my hand. As I reach for the holstered G29, the web of my hand hits that back strap and slides into the scoop (underside) of the beavertail where it locks into place. My hand wraps comfortably around the grip, fingers precisely in the grooves. My hand feels more fully "seated" because it is. No more distracting adjustments are needed to get a comfortable hold. In subsequent shooting sessions, I was able to hit better with it than before - an obvious consequence of not having to fight the grip. The stippling on the reduced backstrap, along with the gritty Decals and Pearce's "pinky finger" extensions on the magazines, all keep the gun in place during recoil - or as much as a 3.7-inch 10mm is ever likely to be firing hot loads. In sum: though minimalist touches to be sure, these BTC frame mods were effective in getting the gun to work for me. They improved how the G29 fits my hand, resulting in more control and better practical accuracy. The same three modifications to the G29's frame were later performed on my G20 (for the same price), so I won't repeat the descriptions. I'll stress again that the G20's factory grip fits my hand; however, after the work to the G29 and some range time with it, I'd grown to like its 1911 grip angle. Why develop "muscle memory" shooting a compact Glock with a 1911-feel, and then have a larger sibling which points like a revolver? For consistency's sake, it just made sense to have Dave do the same work on the G20. 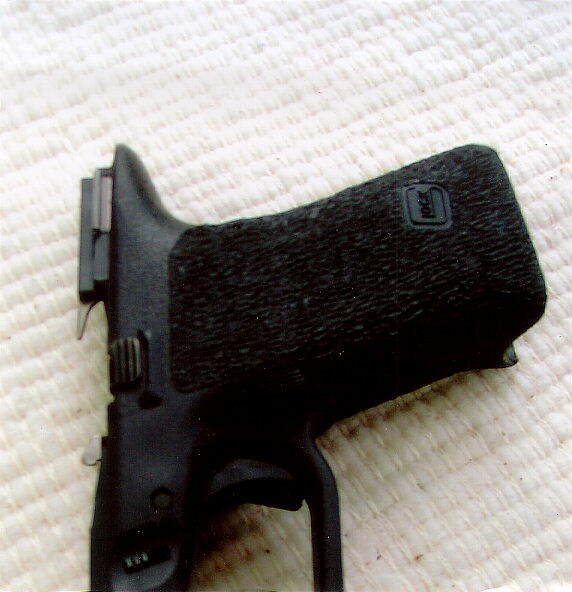 As with the G29, the handling improvements from the back-strap reduction and the stippling were the same. In particular, the radius work on the front strap gives a noticeable feeling of being "up under" the gun. With high-performance 10mm ammunition, shot-to-shot control is improved, as is accuracy. These are three basic, cost-effective modifications that return practical benefits. Bowie's work on my 10mm Glocks clearly improved control of these guns when firing high-performance 10mm ammunition. The ergonomic upgrades resulted in better practical accuracy since I'm not fighting the grip, especially on the smaller G29. BTC reduction and stippling modifications to Glock frames are quite practical, making these guns much more user-friendly and shoot-able. The reliability package includes feed-ramp and chamber polishing. Full-house work includes: bracketed cocking serration on the slide; gritty forward thumb pads; and, at the base of the mag well, side cutouts to facilitate magazine extraction under stress. The reduction, stippling and reliability upgrades will benefit anyone looking to enhance their Glock's usefulness for daily CCW or home protection. Among BTC customers are many members of the American law enforcement community. They've taken their duty Glocks to the next level with various combinations of BTC frame and slide work, including those discussed here. In fact, BTC's business has expanded exponentially with Dave's reputation for doing quality work that, ... well, works. Because BTC modifications significantly improve handling and reliability, Bowie Glocks are, literally, carried all over the world - into places where they need to work 100% for no reason other than their owners lives depend on them. BTC Glocks, mostly 9mm models, are in the hands of a number of United States military and intelligence operatives serving in foreign countries - Iraq, Afghanistan and elsewhere. Federal agents and special operations personnel working overseas also carry them, as do private security contractors. There are a few BTC Glock 21s and Springfield Armory XDs in service there too. During our interview, Dave showed me a digital photo of a Bowie Limited Edition Glock 19, sporting full-house mods. It was e-mailed to him by an operative currently enjoying his deployment in the volatile Middle East. Obviously, the specific whereabouts of these BTC guns and their owners must remain confidential, but let's just say they're being carried in some very rough places - the kind where, when you need your gun to work, it's got to work right now. BTC Glocks: Carried in the Most Dangerous Places. In his small shop in West Union, Ohio, David Bowie relaxes for a rare moment while discussing his grip reduction technique and other custom work. Given what BTC offers Glock owners of all professions, there's no need to default to another gun if you're unhappy with your Glock's grip or how it handles. Check out BTC's website for options or contact Dave Bowie directly. 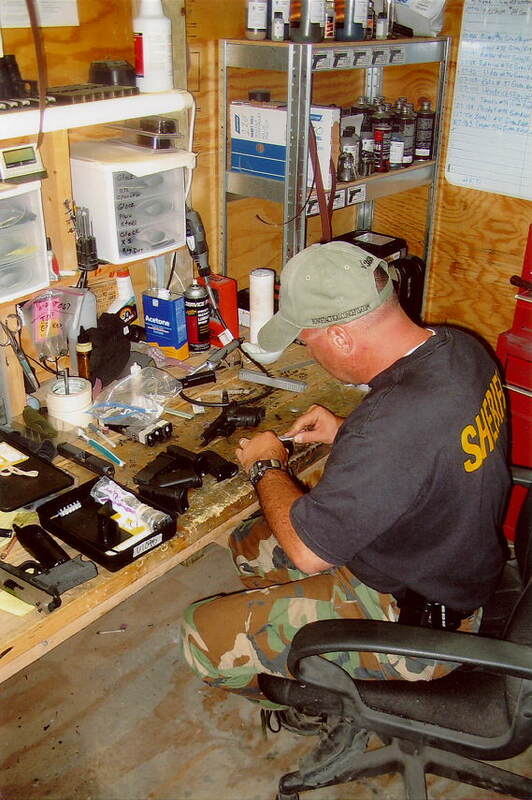 He'll assist you in selecting the right modifications to fix your Glock's "fit" problem - and for less money than you'd pay for a new gun and accessories.